In this chapter, we'll take a look at some free and paid resources available to take the next step on your path to mastering EMC. The application of EMC knowledge varies a lot depending on what type of electronics you're working with and also how large your company is and what resources (financial and time) you have at your disposal. This chapter breaks down some suggestions of further educational resources (books, app notes and online courses) that you can pick and choose from based on your own needs and finances. EMC is a huge subject, so many engineers can and do make an entire career out of just a subset of it. Some people focus on the testing aspect, some focus on regulations, some on design and troubleshooting. With so much to learn, it's easy to see how the guys who are really good at this stuff are often coming up to retirement! Below is my take on some areas of EMC. I've seen other categorizations that come at it from other viewpoints, but as a hardware engineer, this is how I visualize it. Many of these subjects can be a whole career on their own. It's one of the reasons I like EMC so much - there are always more interesting things to learn! Testing and compliance engineers have a good appreciation for rules & regulations as well as what it takes to make accurate, repeatable measurements. As frequencies increase, this becomes more challenging. 2d and 3d EM simulation programs are still fairly niche and expensive, but several companies do specialize in this area (see below). Used extensively in the aerospace and automotive industries where getting things right up front is crucial. Related closely to emissions DFC, but with some extra considerations to take account of, design for immunity compliance is extremely important for many types of products in including medical, automotive, aerospace, military etc.. as well as most electronic products destined for Europe or Australia. Pre-compliance testing involves early testing of units to give an idea of EMI/EMC performance. Often manufacturers set up their own in-house test setups and engineers must learn how to make reasonably accurate measurements to roughly approximate results from an accredited 3rd party lab. Of course SI is a huge subject. Specialists here can dive into high speed board design and simulations. This area is only going to grow as CPU speeds and memory busses continue in to the GHz regions. Based on a foundation of hardware design, physics and test & measurement, EMC troubleshooting is a wide and interesting subject. Rarely do you find an identical set of EMC issues and design constraints, so this subject involves problem solving and creativity. Even at the IC level, almost more-so, EMC must be taken into account. On-chip capacitance allows for a small but very low inductance source of switching current. ICs can also integrate transient immunity protection although additional board level components are often also necessary. Control over these aspects is very much the domain of ASIC design engineers. PI is also an interesting and growing field of study and application. It’s mainly concerned with how in the world to deliver tens of amps at extremely low impedance to satisfy modern IC current switching demands. 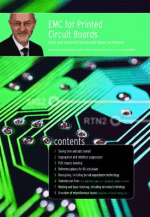 Designing circuit boards with EMI/EMC compliance in mind from the outset is in itself a huge area. With many textbooks (see below) and courses to choose from, there’s no shortage of ways to improve your knowledge in this area. On a larger scale, EMC can and must be applied to larger objects like cars, trains, planes and even buildings. With unique challenges around cabling, shielding and the safe operation of many electrical modules/devices within a larger system, this area requires another special skillset. At larger hardware organizations and 3rd party test labs, often there will be staff or departments dedicated to regulatory compliance. This may involve things like determining applicable standards, ensuring ongoing compliance with updated rules & regulations as well as dealing with compliance impact of product changes. Where are you in your career continuum? Given the vastness of the EMC topic, it's unreasonable to expect to learn it all at once. Typically an engineer will learn bits and pieces over time and by the end of their career they eventually have an expert understanding of the subject. Hardware engineers like to taunt software engineers for many reasons, but one of them is that they get the luxury of correcting mistakes during the development phase pretty much on the fly. Doesn't compile? Fix error - re-compile - done! For hardware engineers, of course we try to catch as many functional problems as possible before pulling the trigger on manufacturing a PCB. But the time to identify and remedy a functional hardware issue can be in the order of weeks. We learn lessons, but the feedback loop is much longer than for software engineers. Because EMC testing typically happens much less often than individual functional PCB spins - maybe twice or 3 times at a well prepared company, or maybe just once at a company who are new to the process, the feedback loop for EMC issues is much longer than for even PCB spins. And if your product fails EMC, maybe you spend a week or two debugging the problem. So for example, in a period of 6-12 months, you've debugged 1 or 2 EMC problems and learned the theory and lessons that go along with solving those problems. Given the myriad number of ways to accidentally create an EMC failure mechanism, having an opportunity to practice from failures (learn and burn) only a couple of times a year, is going to make the process of mastering EMC a very long one. Rules for EMC apply regardless of the size of your company. Do you think the FCC cares if it's a small startup or a multinational's products that cause a radiated emission problem? They don't, so unfortunately regardless of a company's size and how many products they ship per year, the rules still apply. But when it comes to preparing a product for testing, the big guys often have a huge leg up on small manufacturers. So you can see that in terms of chances of passing EMC testing much quicker, the odds are stacked in favour of the larger manufacturers. Small manufacturers often either don't know about the challenge they're facing, or don't have the resources (financial, manpower, time etc..) to implement processes to deal with the issue. But, using the resources outlined in this beginner's guide, engineers from all sizes of manufacturers can map out an individualized path to improving knowledge of the subject. These are some useful app notes I've collected over the years. Hyperlinks often go dead, so rather than continuously update the links, these resources are locally hosted. I do not own the copyright to these, so if you are the owner of any of them and want me to take them down, just email me. All branding has been preserved. EMC textbooks offer a shortcut to getting a career's worth of knowledge in the subject. 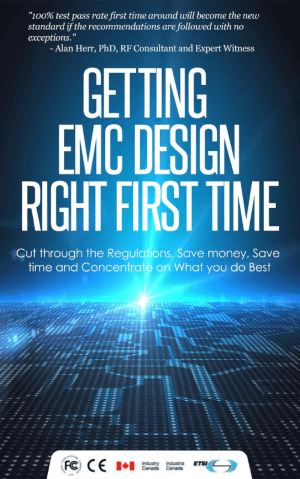 For less than the cost of 1 hour in a 3rd party test lab, you can learn what took these engineers years or decades to learn through hard fought battles with EMC. Seems like a good deal! Of course I need to mention our own eBook on the subject. Downloaded thousands of times and praised by many in the industry, I'm proud of the reach and impact of this publication. Download the first 3 chapters for free here or buy the full eBook here. Keith Armstrong's books are probably my favourite textbooks on the subject due to the balance between theory and practical application. With lots of pictures and diagrams of real-world solutions, he offers a wealth of information on the subject picked up over decades of experience. This particular book covers a lot of the system level considerations including shielding, cabling & connectors, immunity protection and much more. A must have for any hardware engineer or consultant. Get it here. 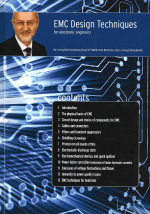 This book is more focused specifically on PCB design for compliance, covering subjects including basic high speed digital design, decoupling, PDN considerations and layer stacks etc. Again, striking a fine balance between theory and practical solutions, this is also one of my favourites. No list of EMC books would be complete without including Henry Ott's classic reference manual. 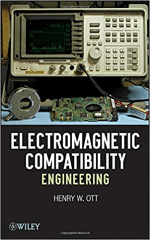 A must have for anyone's EMC book collection, it contains a wealth of material on a huge range of applications. 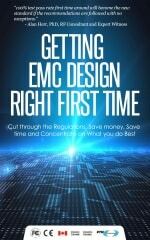 If you have a specific question about design for EMC compliance, chances are this book covers it. Get it here. This really helpful book written by industry veterans Kenneth Wyatt and Patrick Andre offers insight into the tools and techniques used for solving many different types of emissions and immunity issues. 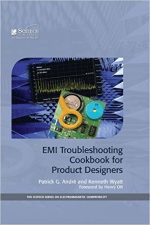 If you have a specific issue you need to troubleshoot, this book gives advice from engineers who have been in the trenches for many years. 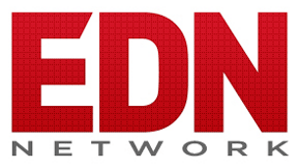 Ken also has a companion online course on EMC troubleshooting in the EMC FastPass training hub that offers over 5 hours of video training on the subject. Get the book here. Congratulations! 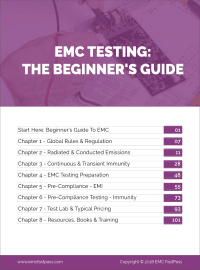 You've made it through the entire Beginner's guide to EMC testing! Now you're ready to take the next step in your journey to mastering EMC compliance. In the section below, check out some online course offerings from EMC FastPass to help you to reach the next level of your career from the comfort of your own office.